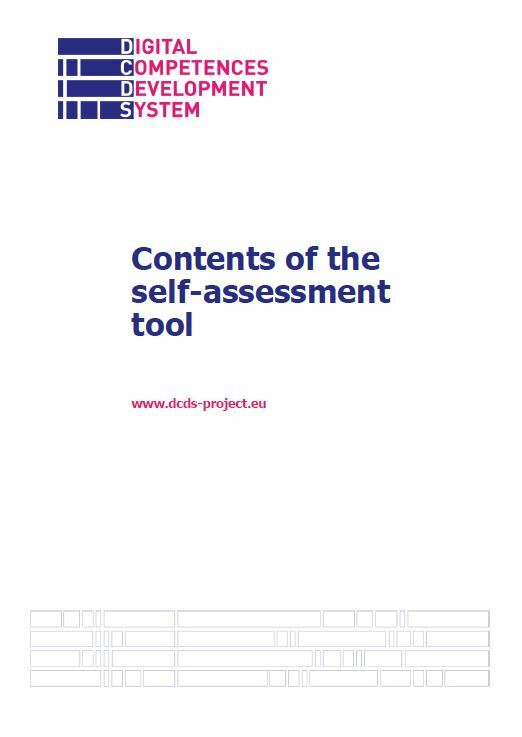 The Self-Assessment Tool is part of the Digital Competences Development Environment and Digital Competences Development Methodology, developed within the DCDS project. In this report, the authors present the full set of self-assessment questions (SA-Qs) and the first set of knowledge and ability questions (KA-Qs) to be used in the online initial assessment of candidate customers of the DCD environment (DCDE), i.e. the online platform being developed by the DCDS project for blended learning activity. These questions, along with some additional KA-Qs, which are being defined as part of the learning material, will be embedded in the platform’s online tool and will be translated into the five piloting partners’ languages (Greek, Italian, Latvian, Romanian and Spanish), in order to be tested during the pilots during March-May 2019. The potential users of the DCDE are adults (25+) with no or low digital skills. In fact, people without any digital experience and skills will skip the online self-assessment test, as they would not be able to take it and also because their need for training is self-evident. Absolute beginners will therefore be offered to enter directly into the DCDS blended learning process, after taking an initial face-to-face training designed to enable them to start using a computer, performing simple operations with keyboard and mouse and using the desktop interface. Absolute beginners will be asked anyway (in person) a set of profiling questions to assess other aspects that may be relevant to facilitate and enhance their training. For the other potential DCDE users, the questions illustrated in this report aim to identify their digital competence weaknesses, so as to decide whether they indeed need to be trained by DCDS (which is currently limited to DigComp’s foundation level 1-2), and which training offer they should start from. The results of the online self-assessment will feed into the candidate/user profile, where they will be integrated with the answers to another set of profiling questions. These additional questions concern the candidate’s personal data, his/her main interests and motivations and other aspects that could help in the learning process.